With Florida’s U.S. Senate, gubernatorial, and agriculture commissioner races all falling within the narrow margin that automatically triggers a recount, Secretary of State Ken Detzner ordered machine recounts in all three. Florida’s U.S. Senate and governor’s races have been among the most closely watched in the nation. Both races had lower than 0.5 percentage-point margins, which, in Florida, automatically qualify for an electronic recount of votes. During the press conference, Gillum called out President Donald Trump, Gov. Scott, Sen. Marco Rubio for their opposition to the recount, saying he was unsure of their excuse but that it was “not democratic and… certainly if not the American way” to end the vote count simply because they don’t like the direction in which the vote totality is going. He added that if the shoe was on his opponents’ foot, “not one of them would seek a different outcome.” He also noted that once the recount occurs, he’s willing to accept whatever the outcome is. Gillum’s attorney Barry Richard, who represented George. W. Bush during the 2000 recount, said that the two situations were “vastly different” but called both “unprecedented” in their own right. 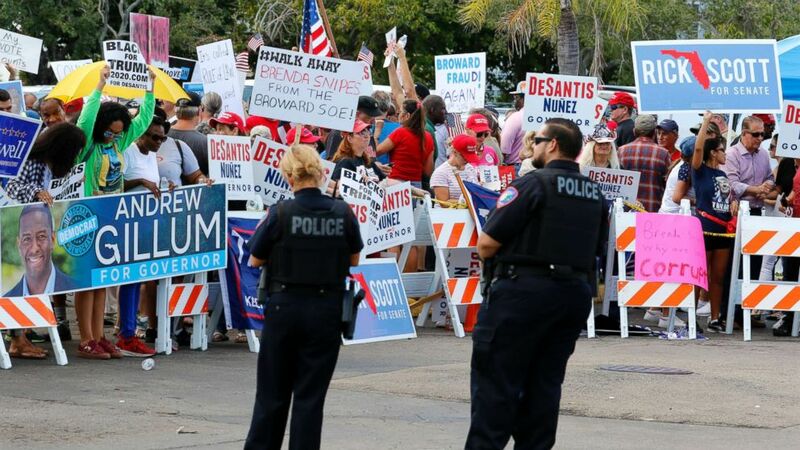 In the last two days, attention had turned to vote counting in Broward and Palm Beach Counties — Democratic strongholds in South Florida where counting was still underway, and where Scott’s campaign had filed lawsuits against county election officials.